via Email and SMS Text Alerts. Amy Meissner shares details of her distinctive options trading methodologies to help experienced options traders learn how to minimize their downside risk and realize reliable monthly income. The Weirdor Trade Alert Service enables subscribers to follow the trades she makes with email and SMS alerts, and learn her methodologies & trading philosophy via regular video updates. Amy began exploring options trading while still working in the software and multimedia industries in the mid-1990’s, trading credit spreads in the SPX. It was hit or miss back then, but wanting to learn more and get serious about making a living trading options, Amy felt encouraged to come back and give the options initiative another look in 2005. After garnering a steady earnings stream and making continuous efforts to improve the quality of her trading strategies, she made options trading her full time occupation in 2006. Along the way she found some good mentors who gave her the confidence to refine proven methodologies such as the Iron Condor and the Weirdor, and make them uniquely her own. Amy’s specialty is options trading for monthly income using high probability option strategies. Her bread-and-butter trades are the Nested Iron Condor and the Weirdor. She is an active member of Capital Discussions, and is a sought-after webinar leader. Within the professional options trading community, Amy is known as a stable, disciplined trader who calmly manages her risk throughout the life of the trade even in volatile market conditions. She will tweak her approach slightly from time to time, making small adjustments here and there as the market moves and changes. But consistency is her distinguishing virtue. Amy’s steady confidence and sound methodology have rewarded her with steady returns, year after year. The Weirdor strategy is a high probability options trade that can be done on liquid index and stock options. The trade came about as a variant of the Iron Condor. Recognizing that the market generally will go up 75% of the time, adjustments on the call side are thus more common and costly. The Weirdor compensates for this by using fewer call credit spreads than the Condor, and not defending them much with market moves to the upside. The Weirdor tends to be a smooth trade, using adjustments to keep the delta fairly flat and keeping losses small as time value or theta is captured. This is a trade alert service for Amy’s specialized version of the Weirdor trade strategy in the Russell 2000 Index. Follow along with Amy’s moves each month as she trades a 1-tranche Weirdor in an $20K Reg-T account. * The trades will be put on each monthly expiration cycle around 40-55 days to expiration, and are generally kept until 14 days to expiration, so each trade will be about 30-45 days in overall length. Overview video of the trade, basic setup, adjustments, and exit strategy. Real time trade signals for the Weirdor for each monthly expiration cycle. Occasionally two or more trades may be made per month. As each trade is made an alert will be sent out via SMS and Email and include all trades for each position (trade entry, adjustments, and exit). Weekly videos to recap where the trade is at the end of each week, and what to look for in the week to come. Recap of each trade upon completion to go over how the trade performed and the outcome. Includes a question and answer session about each just-completed trade. Why Learn the Weirdor Strategy? Amy started her trades for this service on February 4, 2015. Amy's trade alerts are FREE for 15-days, then $119 per month. With Amy's solid performance history, you should easily cover the cost of the subscription. As a subscriber to Amy's trade alerts, you are eligible for a $0.10 commission reduction at Lightspeed Trading. That would bring your base execution rate to $0.55 per contract (plus regulatory fees, exchange fees and certain per-trade minimums that may apply)! This alone can pay for the subscription for active traders. Excellent!!! You are doing a great job with the service. I appreciate your attention to detail. The service is a superb value. 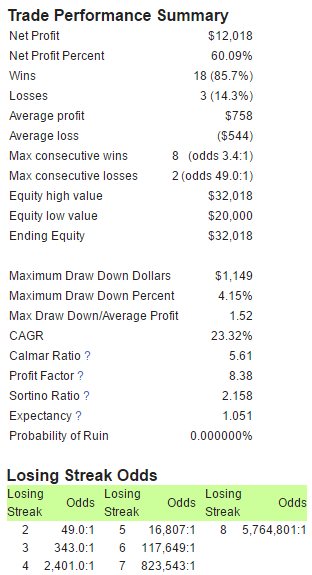 This is an income strategy known to be very resilient and does not have large drawdowns if managed properly. You have been very responsive of the questions and comments. It is an excellent way to earn while learning because you provide the detailed trade plan in advance and also provide the weekly updates explaining the reasoning behind each trade and adjustments. Amy, I am a believer in your strategy! I went back to 10/10/2008 and using your criteria (my test of all strategies) it actually made money! It is backtested on OptionNet Explorer. 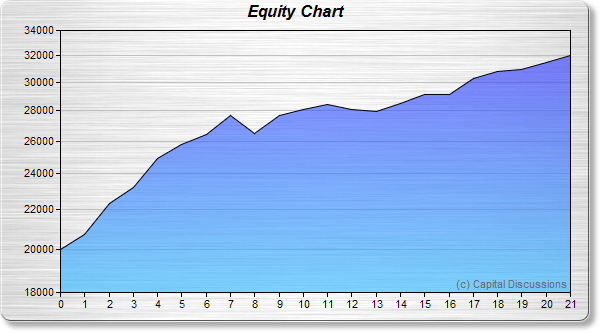 This is the only one I ever backtested that came out profitable…and was a low maintenance trade! I really appreciate your excellent communication regarding the Weirdor trade (notes, texts, email and the video summary). Happy to be a part of your trading community. Do you provide trade details so we can follow along in our own option analysis software? Yes. The details will be provided during each weekly video and uploaded to the trade images tab in the class web page. The yields are based on the maximum margin used during the life of each trade. The margin doesn't change much during a trade, even after adjusting the positions. The maximum margin used is close from trade to trade. What is the margin required for one tranche? Approximately $18,000 for a Reg T account. Having up to $25,000 would be helpful but not necessary. Are these trades based on real trading or simulations? Real trading. Amy trades the Weirdor for her income. The trade alerts closely follow her live trades. Because Amy is trading a larger account, she reduces her trade size into a smaller paper trading account with slippage and commissions to simulate her live trades as closely as possible. Yes. All trades are fully documented and available to you as long as you are a subscriber. Are the real time alerts sent out before or after you are filled? Both. Amy will occasionally send a message that she is thinking about a trade. She always sends out alerts after she is filled. What happened in the month with a -7.15% loss? Amy got over confident and didn't diligently check her trade after an adjustment. She thought she handled the adjustment properly but only part of her contingent order was filled. The market continued moving against her and when she checked it later in the day, the trade had moved further against her. Because the contingent order wasn't completely filled, it put the position in a more difficult spot. Amy stayed in a little longer to try to salvage the trade, but later decided to close the trade. Her adjustment should have prevented such a big loss. It was a good lesson for Amy to ensure that the trade you wanted actually got filled correctly. Can this strategy be applied to the NDX and SPX? Yes. Amy will focus on the RUT for this service and may expand it in the future to include NDX and/or SPX. The trades in this Trade Alert Service will be made in real time in a ThinkOrSwim Real-Time paperMoney account with Reg-T margin. A single tranche Russell 2000 Weirdor will be traded, emulating the larger multi-tranche trades made in her live accounts. Capital Discussions and Amy Meissner are not broker dealers or investment advisors. Amy's trades are not trade recommendations. Capital Discussions, and Amy Meissner, do not know you or what level of risk is appropriate for you. You have to make your own trading decisions. Save More and get BOTH the Nested Iron Condor and Amy's Weirdor Trade Alerts Services for one low price! Do LeadPlayer™ Opt-In Boxes and Calls to Action Appear On iOS and Android Device? Can I choose any point in the video for optin box of call-to-action text appear? What Email service providers do you support? Can I mark my LeadPlayer™ videos as "public" in YouTube? Can I remove the LeadPlayer™ logo from my video?